It's no secret that women often suffer with night sweats in the years prior to menopause. During perimenopause, changes in hormone levels can trigger seemingly random changes in internal temperature, to which the body responds by producing sweat to cool down. This can occur when a woman is asleep, and she may awaken to find herself cold and clammy from a sweating episode. 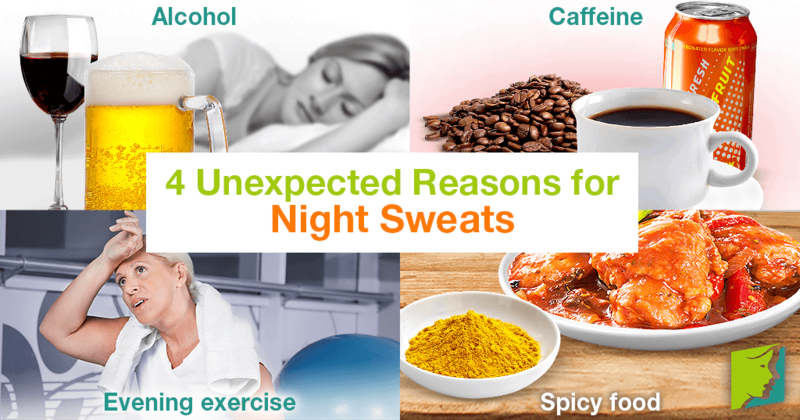 It is easy to dismiss night sweating as an inescapable part of menopause, then; but there are other - perhaps unexpected - factors that that can also trigger or intensify night sweating episodes. When alcohol is consumed, the body metabolizes it in the liver, where enzymes break down most of it so cells can absorb the molecules. This can only happen at a rate of approximately 12 ounce serving of beer, or five ounce serving a wine per hour. If consumed at a higher rate, alcohol accumulates and is passed out of the body through urination and the sweat glands. For this reason, it is advisable to avoid excessive alcohol consumption within two hours of going to bed, as it could trigger resultant sweating episodes that may also be odorous. Caffeine, found in coffee and fizzy beverages, exerts a stimulating effect on the body that can last up to six hours after its consumption. It increases heart rate, internal temperature, and blood flow to the extremities, all of which can cause sweating. You should avoid consuming caffeinated drinks during the evening to prevent its stimulating effects from causing sweating and interrupting your sleep. Regular exercise is necessary for a healthy, strong body, and can actually reduce the occurrence of night sweating episodes. However, you should avoid exercising during the evening because it raises internal body temperature - and sweating - for up to two hours afterwards. Try exercising in the morning, or right after work, to reduce sweating without inadvertently worsening it. Eating spicy food, such as curry, can trigger sweating known as gustatory sweating, which may last for several hours after finishing your meal and often comes with unpleasant odor. Try enjoying milder options during the evening and save the spicier choices for lunchtime to prevent them from affecting your sleeping patterns. It's important to remember that, although the primary reason for night sweating during menopause may be hormonal, this is not to say that other factors in your lifestyle are not worsening the symptom. If sweating episodes are causing you to feel tired during the day, it is advisable to consider cutting these triggers from your daily life. Making changes to your daily routine or diet may seem like a big sacrifice, but getting rid of a few bad habits is a small price to pay in return for sweat-free, uninterrupted sleep. Drowning in sweat? Night sweats during early pregnancy are normal. Find out what you can do to alleviate this unfortunate symptom. Night sweats and vitamin deficiency affect up to 70% menopausal women. Read on for more information on night sweats and vitamin deficiency. Can Anxiety and Stress Cause Night Sweats? Night sweats are episodes of sweating that occur while a person is sleeping. Many things can cause night sweat episodes, including stress.